Thai food is one of my favorite cuisines, but I had only tried it once before I started dating my husband (and it was not love at first taste). Perhaps I didn’t know what to order, or perhaps the restaurant wasn’t very good. All I know is that I never tried it again until my husband’s and my first date…and it was delicious. Since then, I’ve explored many a Thai restaurant’s menu, and I definitely have my favorites. Green Curry, Panang Curry, Tom Yum Gai or Tom Kha Gai, Pad See Ew–if you’ve frequented a Thai restaurant, you’ve probably tried most of these. But my absolute favorite is a basil chicken dish called Pad Kra Praw. After trying this at my local Thai restaurant, I knew that I had to try to make my own version. While the flavor isn’t exactly the same (probably due to added sugar and who knows what other ingredients! ), I like it a lot and my whole family (kids included) loves it. When I say I’m making Pad Kra Praw for dinner, I always hear resounding yays! I based my recipe on this one, but switched out some of the ingredients and adjusted amounts until it tasted good to me. My local Thai place makes it with minced chicken, which I love, but its a bit more work for me, so I go the lazy route and just cut it up into small pieces. You want them to be small so that the sauce coats every delicious bit! 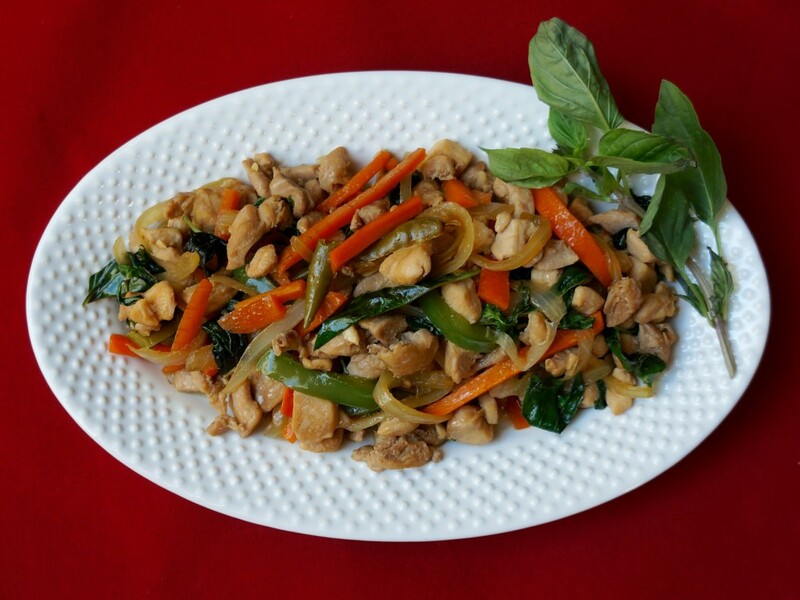 The key to this recipe is Thai basil. Not just any basil. Thai basil. It has a stronger, sharper flavor than the sweet basil that you typically find in stores, and it adds a slight sweetness and spicy notes to the dish. 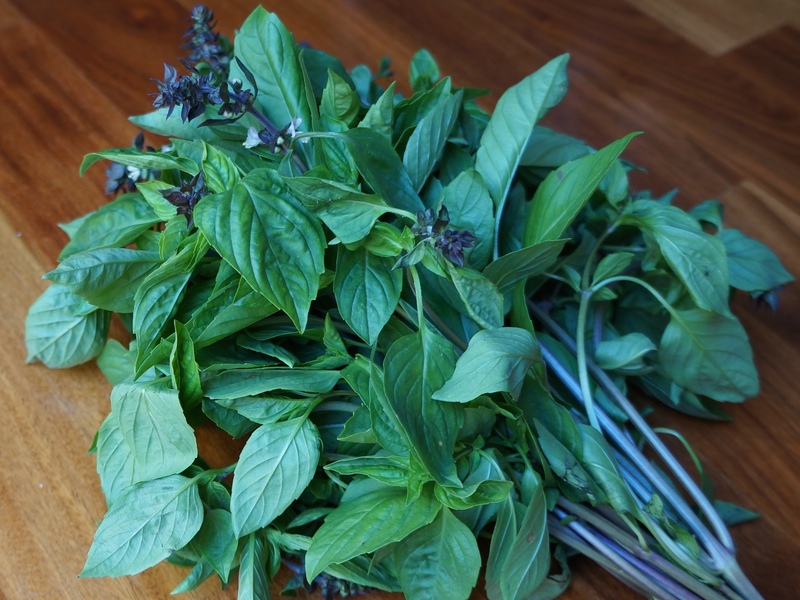 Of course, if you can’t find Thai basil, you can use any type of fresh basil, but it really is worth the effort to find the Thai variety. I have seen it seasonally in my local farmers’ markets and year-round at Asian grocery stores. Pad Kra Praw is the perfect weeknight meal–I load it up with veggies and serve it over rice–and the leftovers taste even better. I hope you love it, too! You can enjoy this recipe while doing the 21DSD. 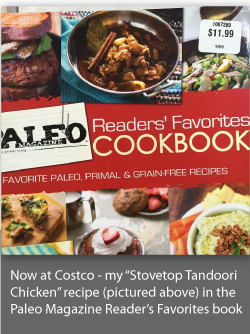 Heat the coconut oil in a large wok or deep skillet over medium-high heat. When it shimmers, add the chilies and let them fry for a couple of minutes, taking care not to burn them. Add the minced garlic and stir fry for about 20 seconds or until fragrant. Again, take care not to burn it! Add the chicken and stir to coat with the oil, chilies, and garlic. Cook over medium high heat, stirring occasionally, until the liquid releases from the meat. When the liquid has reduced by half, add the tamari and fish sauce. Continue cooking until the chicken is completely cooked. Add the carrots and cook for about 5 minutes. Then add the bell peppers and onions, stirring well. Cook for just a few more minutes until the bell peppers and onions are about half cooked--you want them to be a little firm, not mushy. Turn off the heat and gently mix in the Thai basil leaves. Let sit for 5 minutes. Serve over rice or cauliflower rice. Enjoy!